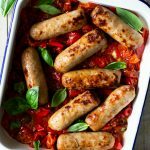 A super easy and simple Italian sausage bake made with stewed tomatoes, peppers, spices and fresh herbs. Serve with salad and crusty bread or creamy mashed potatoes for the ultimate one-pot comfort food meal any day of the week! Oh how I love having a boyfriend that can cook. Nathan hasn’t written on the blog yet but he’s been quietly working behind the scenes knocking up incredible recipes like this penne with pancetta and ricotta…..omg it’s one of my fave pasta recipes ever. 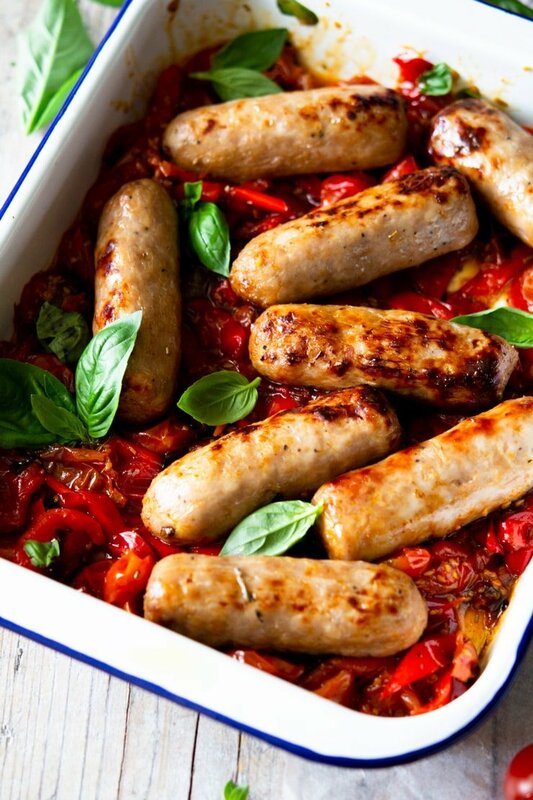 The tomato sauce last week,….he perfected that to a T and now, this Italian sausage bake! The thing I love most about it is that it’s so simple but has SO much flavour…and I mean a ton of flavour! We had this twice in one week and I could’ve gone for a third except I was on the verge of turning into a sausage so I decided to back off for a week or so….there’s only two of us in our house and one happy dog. We served this Italian sausage bake with creamy mashed potatoes (I live in Scotland so it’s acceptable at this time of year, ok) and it was so comforting and sooo delicious. 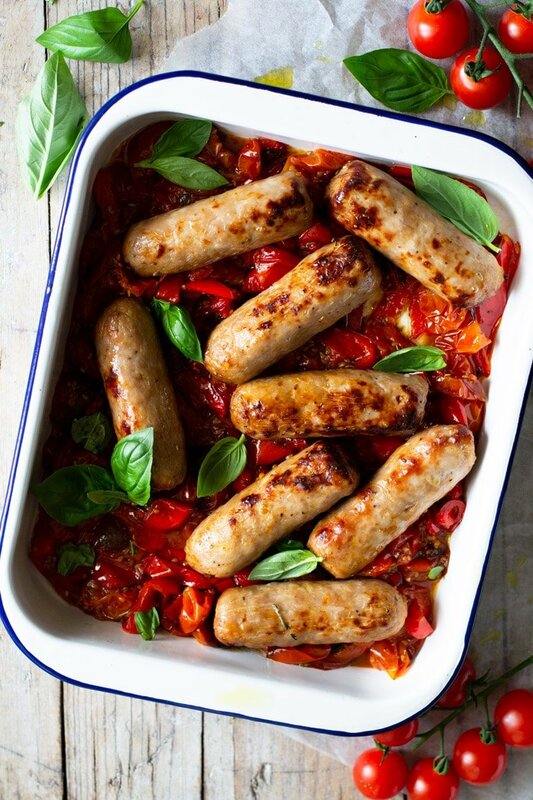 The great thing about this sausage bake is that it can be served all year round, with mash in the colder months or with salad and some crusty ciabatta bread in the warmer months….you could even eat this cold. What’s In This Italian Sausage Bake? How Long Do You Bake The Sausages For? The sausages don’t take that long to bake (roughly 25-30 minutes). I like them to be slightly charred on the outside because they taste better and look nicer too. To make this Italian sausage bake I roast the veggies first for 10 minutes then add the sausages so the aren’t over cooked and dry by the time the veg is soft and saucy enough. First, slice the cherry tomatoes in half and add them to a baking dish. Cut the peppers into slices and add them too along side the balsamic onions, garlic cloves (skins on and crushed with the back of a knife), red pepper flakes, herbs and fennel seeds (photos 1-2). Add a glug of olive oil and a good pinch of salt and pepper, bake in the over for 10 minutes to soften (photo 3). Removed the softened veg and place the sausages on top. Bake for another 15 minutes, turn the sausage and bake for a further 10-15 minutes. The sausages should be browned, cooked through and the veg soft and stew like. Serve with crusty bread, salad or creamy mashed potatoes (my fave). If you’ve tried this Italian Sausage Bake or any other recipe on the blog please let me know how you got on in the comments below, I love hearing from you! You can also FOLLOW ME on FACEBOOK, TWITTER, INSTAGRAM and PINTEREST to see more delicious food and what I’m getting up to. 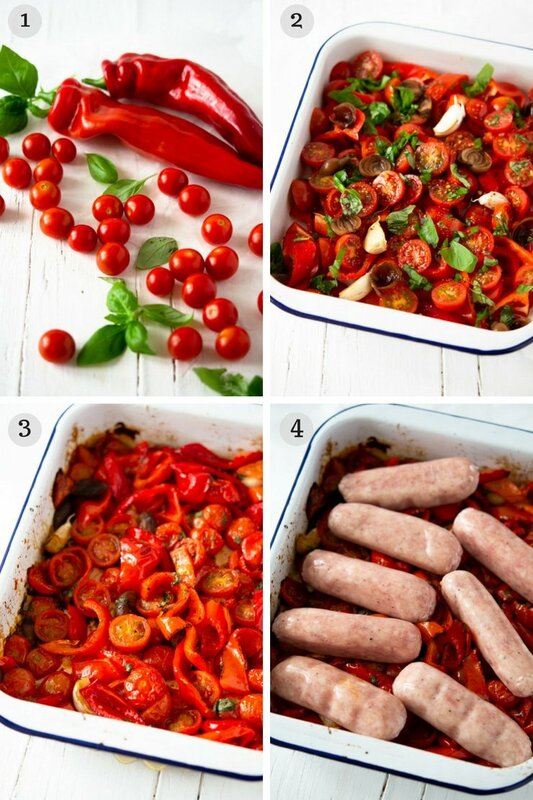 A super easy and simple Italian sausage bake made with stewed tomatoes, peppers, spices and fresh herbs. Slice the cherry tomatoes in half and add them to a baking dish. Cut the peppers into slices and add them too along side the balsamic onions, garlic cloves (skins on and crushed with the back of a knife), red pepper flakes, herbs and fennel seeds. Add 2 tbsp of olive oil, 1 tsp balsamic vinegar and a good pinch of salt and pepper, bake in the over for 10 minutes to soften. Serve with crusty bread, salad or creamy mashed potatoes. Haha yes, it so is! Thanks so much Monica! gorgeous photos and gorgeous recipe! I love Italian sausages so this would be perfect for an easy weeknight meal! Thanks so much Georgie, it’s great for weeknights!